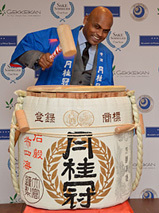 Rajan Rengasamy of UAE wine supplier Spinneys has won the first ever Sake Sommelier of the Year competition held outside Japan. The award, launched this year by the Academy of Food & Wine Service and the Sake Sommelier Association, saw 5 semi-finalists and subsequently 3 finalists chosen from about 50 entrants. The 3 finalists showcased their knowledge in sake in the grand final, held in front of a live audience in a central London hotel, and took part in a food pairing test, a service task and a blind tasting, all using traditional Japanese crockery. 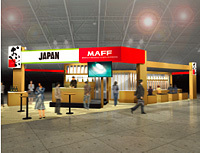 IFE is the UK’s biggest trade fair for food and drink, and this year will feature a wide selection of outstanding Japanese products at the MAFF Japan Booth (N5040) in Hall 4. Please see below for highlights from this booth. You can also visit Japan Pavilion (N5006) run by JETRO, which features 14 companies and organisations, all exporters to the UK. Find out a range of products and exhibitions here (PDF 2.6MB). Please note that IFE is free to visit but you'll need to pre-register; click here and enter your delails to guarantee entry. Eat-Japan 2013 Out Now !! Eat-Japan, a full-colour, feature-packed magazine is out now. 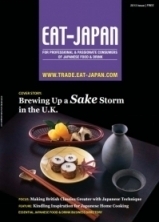 We've kept the directories, listing and glossary that were the backbone of this publication's predecessor, the Eat-Japan Japanese Food Trade Directory, and added some great on-trend features covering the very latest topics in the Japanese food and drink market in the U.K. 45,000 copies will be distributed to Japanese and non-Japanese restaurants, stores selling Japanese ingredients, and food and beverage trade media. The directory will also be distributed over the next twelve months at trade fairs in the UK, Europe and Japan. The entire edition can be downloaded free of charge from the link on the left. 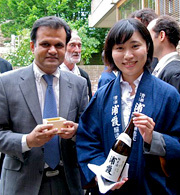 National Trading Inc. Kimura Brewery had much to celebrate on the 11th September, when its Daiginjo Fukukomachi picked up the coveted the 6th Champion Sake 2012 Award at the world’s most rigorously judged independent wine competition, the IWC (International Wine Challenge). The Awards Dinner took place at Hilton Park Lane, London, with Mr Keiichi Hayashi, Ambassador of Japan in attendance. Coinciding with today's London Olympic kick-off, a Soho restaurant is launch a special miso and Marmite fusion ramen, in collaboration with leading Japanese miso maker Marukome. 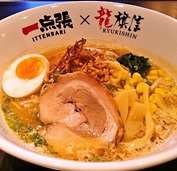 From the kick-off of the Olympics today, Soho ramen restaurant Ittenbari will be collaborating on a limited edition dish with Marukome, Japan's leading miso maker, which will be available until mid-September. This month, as part of a unique drive to promote Japanese sake and inspire stimulating cultural exchange, four sake brewers visited three locations in the UK.